If you’re wondering what to do in this panicky market, I’ve got a few “get rich quick” words for you: buy cheap, high-quality dividend growers with both hands. 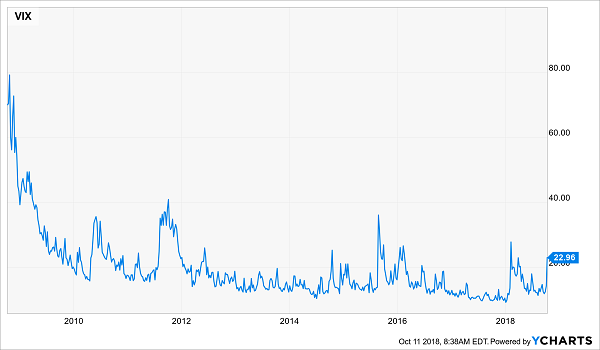 This is the CBOE’s S&P 500 Volatility Index, which captures panic in a picture, spiking when the market tanks and dozing off when markets gently rise. 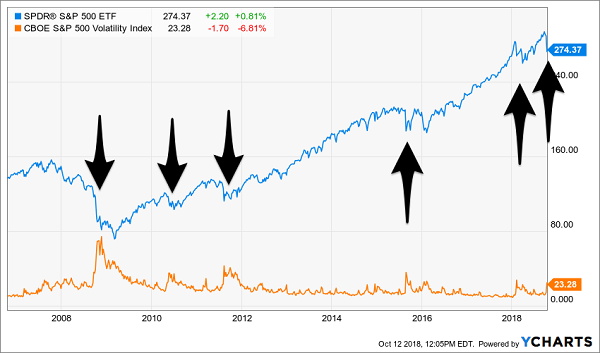 When you overlay the VIX with the market’s ups and downs, a can’t-miss pattern emerges: folks who “bought terror” have ridden every dip to big gains! Be greedy when others are fearful? You bet! But wait, is this time different? After all, stocks-at-large do seem pricey. I wouldn’t dive into an S&P index fund today (trading at a rich 24-times earnings) just because the VIX spiked. So what do we buy now? I’ll answer that in 3 words: dividend-growth stocks. But not just any old dividend growers. We want stocks whose dividends are growing faster than the yield on the 10-year Treasury note. Because why would you sit in “dead money” Treasuries when you can grab a dividend that’s doubling every 5 years (or, better yet, rising 600%!)? And (for once) Wall Street (kind of) agrees with me. Translation: stocks with rising payouts and heaps of cash won’t even notice a slight rise in borrowing costs. Here’s the truth: if you’d jumped on cash-rich stocks with fast-growing dividends 3 years ago, when this rate-hike cycle started, you’d have demolished the market. 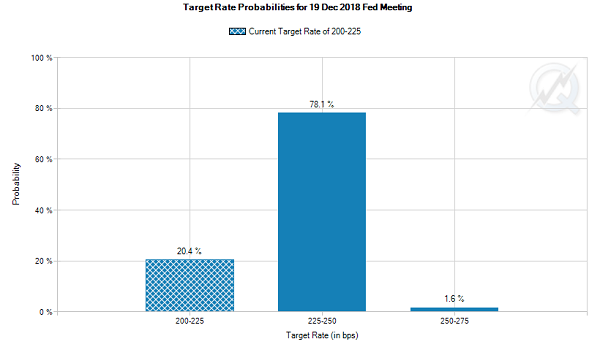 Consider the case of Boeing (BA), which I pounded the table on in December 2015—the same month the Fed started nudging rates higher. 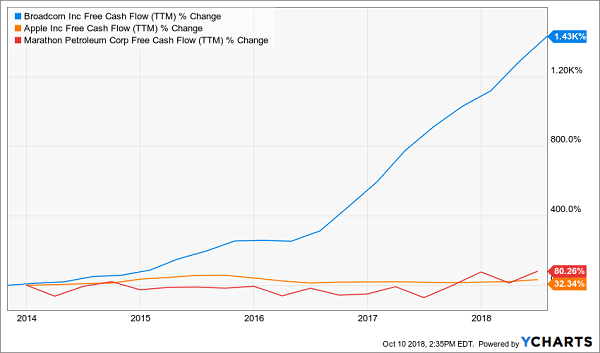 Free cash flow was soaring—at the time, the company’s FCF yield was 8.4%. In other words, in just a year, BA was throwing off nearly 10% of its market value in FCF! The dividend was accelerating, having doubled in the previous 5 years, with each year’s hike eclipsing the last. The result? Boeing shredded rising rates and handed us a massive 206% total return in 2 years! We’ll start by stacking them up by free cash flow yield, one of the yardsticks Jefferies talked up last week. As you can see, all 3 are generating at least 5% of their market value in FCF, with Marathon clocking in at 10%. Those are terrific numbers. And the FCF backstopping them is soaring. 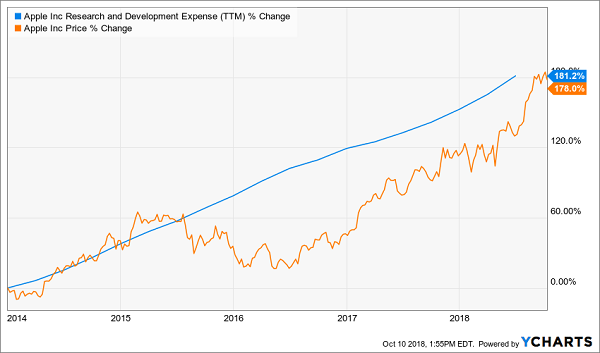 Now let’s take a closer look at each and see what’s driving these gains, starting with Broadcom (AVGO), whose cash flow has exploded 1,430% in the last 5 years. The chipmaker says it plans to give 50% of its prior-year FCF to shareholders as dividends, and it’s close to that target, sending out $2.7 billion in the last 12 months. 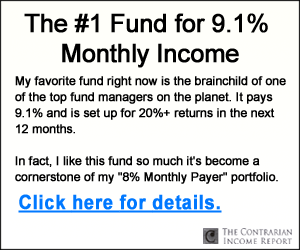 That, plus the fact that it pays out a low 36% of FCF as dividends are dead giveaways that a big hike is on the way this December, building on the unbelievable 600% in increases Broadcom has handed out in the last 5 years. 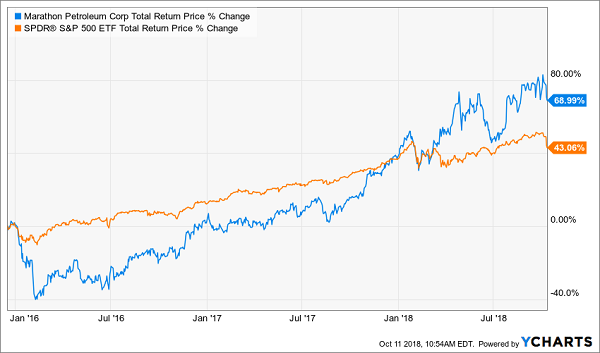 And there’s another way Broadcom rewards investors that few people consider: soaring R&D spending, which translates straight into a higher share price. Finally, Broadcom’s soaring cash flow has the stock trading at just 13.7-times FCF, way down from 22-times five years ago. That’s ridiculous for a cash machine like this, and any further pullback—especially on overdone fears that its $19-billion purchase of CA Technologies will face a national-security review—makes it even more appealing. Because even if Broadcom were to lose out on CA, it would just dump more cash into R&D, driving the stock higher still. Jefferies also named Apple (AAPL) as a great buy when rates rise, and I agree. And thanks to its soaring FCF and legendary cash hoard, Tim Cook’s company can keep this tango up for decades without breaking a sweat. 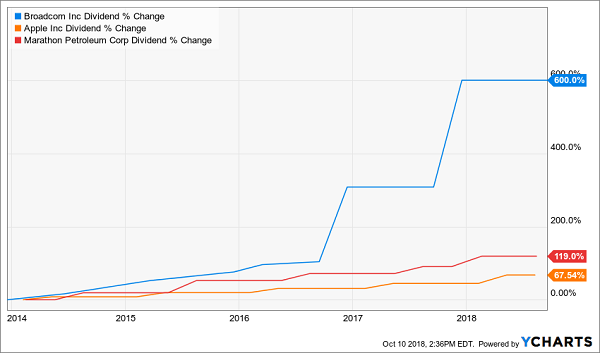 No wonder the dividend has jumped 92% since Apple started its payout in 2012, making the company’s tiny 1.7% current yield go down a lot easier. To be sure, the stock isn’t as cheap as it has been, at 19-times FCF, but when it comes to Apple, swing traders need not apply. The key is to hang in as the company evolves into more of a service provider and less of a device maker. Consider this: in Apple’s latest quarter, sales of high-margin services like Apple Music subscriptions, apps and streaming video spiked 31%, making services easily the company’s fastest-growing business. That’s literally changing the face of Apple. In Q3, services were 18% of total sales, nearly doubling their 10% share in the same quarter just 5 years ago. So now’s the time to climb aboard as more investors catch the hint. The “locked-in” dividend hikes make the deal even sweeter. 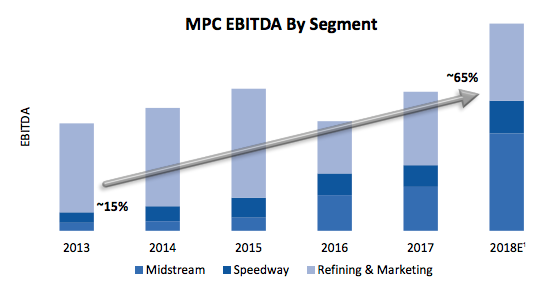 When most folks think of Marathon Petroleum (MPC), they think of refining. And the company does own 16 refineries, making it America’s biggest refiner. But it also has 3,900 company owned gas stations and 7,800 branded stations. Marathon also has stakes in MLPX LP (MPLX) and Andeavor Logistics LP (ANDX), giving it access to 15,000+ miles of pipelines, as well as shipping terminals and processing facilities. A diversified energy play like this is exactly what you want when rates rise. Here’s another safety valve: management is jumping on MPC’s cheap valuation (9.8-times FCF) to boost share buybacks. That throws a cushion under the stock because it boosts per-share earnings—and share prices with them. The thing to keep in mind is that these moves have come on top of MPC’s 2.2% dividend, which, as I showed you above, has more than doubled in the last 5 years. And like our 2 other rising-rate plays, MPC can easily keep up the pace. On top of its soaring FCF (remember that huge 10% FCF yield I showed you earlier? ), it boasts $5 billion in cash. Put another way, when you add its cash on hand to its last 12 months of cash flow, you get an incredible 25% of market cap! 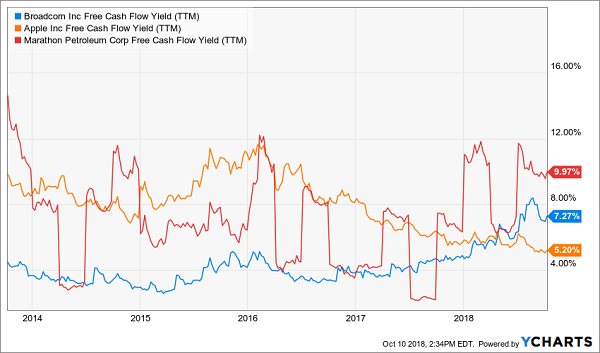 Throw in a low 20% of FCF paid as dividends and the fact that MPC sometimes announces more than one dividend hike a year and you can only draw one conclusion: now is the time to buy—before the next dividend is announced in late October. 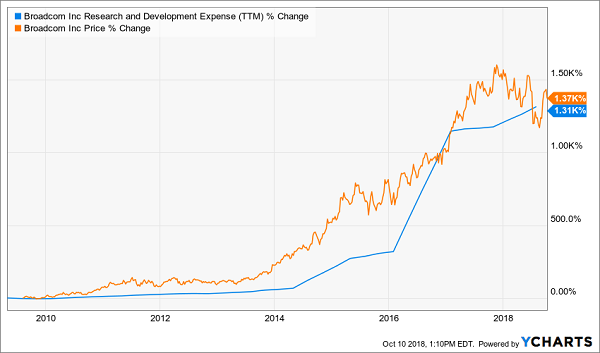 What if I told you I’d found a way to take a big-name stock like Apple, with a paper-thin 1.7% current dividend and turn it into a massive 10.2% cash stream? Payouts like that mean up to $10,200 a year in dividends on a $100k investment. That’s 6 TIMES what you’d get from Apple’s “normal” payout! I urge you to take a second and think about what this could mean to you: incredible double-digit cash dividends right now—straight from the stocks you know well. 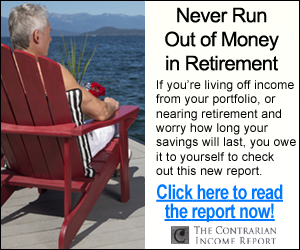 It’s that simple: no risky options, dangerous derivatives or short selling. Simply buy the stocks you love, straight from your online brokerage account. But instead of their paltry sub-2% dividends, you’ll get their “secret” payouts of 7.5%, 8% and even 10.2%! In know that sounds crazy, but I assure you it’s 100% real. It’s all thanks to an unsung group of investments I call “dividend conversion machines”—so named because they “convert” pathetic S&P 500 dividends into gigantic cash payouts. They’re the closest thing I’ve ever seen to the perfect investment!